IE6 update: A hat trick. The guys from “Done21” presented an ingenious way of “upgrading” your visitor’s IE 6 to IE 8. This much needed change for everyone is available at their site as an add-on for the web page using some jQuery magic and obvious good style copying of that infamous IE yellow-bar. 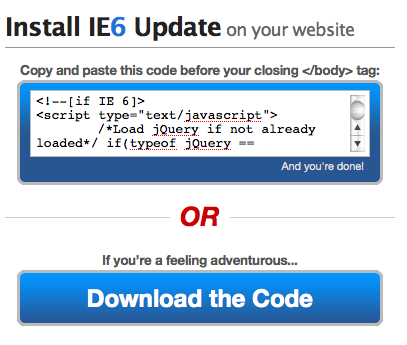 Head over to the ie6update.com site and plant that seed on your web page. Great; create a message that fakes an application message, nothing like inspiring user trust in the web. Nice, but already done, Pushuptheweb is a project that displays a message to IE6 users to upgrade, FF1 and FF2 Users to upgrade to FF3 also Opera and Safari are supported all in one script.